SAGITA COM - Stereoscopic Player 1.9.8 adalah software video player yang dirancang untuk mendapatkan video 3 Dimensi (3D). 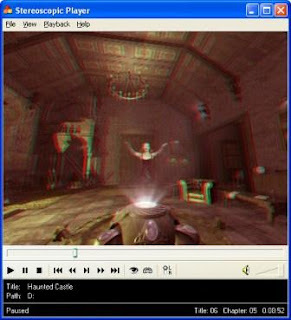 Selain fitur untuk memutar video, Stereoscopic Player dapat digunakan untuk melihat atau memutar video yang diambil langsung dari perangkat lain yang terhubung dengan PC. media player yang berasal dari perusahaan jerman ini memang beda dari sekian banyak media player yang beredar saat ini. Supports Video format included *.avi, *.mpg, *.m2ts, *.mts, *.ts, *.mp4, *.ssif, *.wmv, *.asf, *.mov, *.mxf, *.mkv, *.flv. Supports photos in *.mpo, *.jpg, *.jps, *.tif, *.gif, *.png and *.bmp format. Digital Rights Management (for stereoscopic Windows Media files only). Playback of any other format supported by third party Direct. Windows Media 7.1 and 5.1 multichannel audio decoding. 3D-DVD playback 1Live playback from capture devices. Built-in video library stores settings for each movie. Retrieves data from stereoscopic metadata servers. Supports Windows Media Dual Stream files. Supports MXF files of Digital Cinema Packages (DCPs), including XYZ to RGB color space conversion. Import and export of stereoscopic metafiles. Compatible with Windows Media Center IR remote control. Synchronized control of external effects via DMX512, serial port and execution of programs and scripts. DXVA2-based GPU-accelerated video decoding, etc. Windows XP/ Vista/ 7/ Server 2003 (32 and 64 bits). 3D hardware (3D glasses, 3D display, 3D projection system, etc.). 100 MB free HDD space. Graphics mode 800x600 with 16-bit colour. Tampilannya kayak player clasic ya ?